A note from your friendly neighbourhood Market Manager. As a consumer, you are flooded with eating options. From restaurant delivery apps, chilled meal boxes on your doorstep, and the glowing frozen aisles and piles of perfect shiny vegetables at the grocery store, we are encouraged to distance ourselves as far from the land and our producers as possible. Why do we want to keep the reality of the farm at arm’s length? Perhaps it is a simple convenience issue. Despite the entire world continuing to eat- and as our population grows, eating more every day- our small farmers are struggling. The volatility of our climate, the industrialization of agriculture, and high rates of depression and mental illness create a perfect storm for small farmers across the globe. Farming is a highly demanding and stressful profession that fewer and fewer young people are choosing to pursue. Perhaps by allowing convenience to play such a role in our eating choices we devalue the work of our producers. By keeping the farm and our producers out of our sight and mind, we don’t need to share their pain and struggles. Overall it makes sense. In a society that praises busyness and prioritizes convenience, we believe we have no other option but to rely heavily on prepared meals and delivery. Meal planning, shopping and cooking takes energy that we simply cannot spare. Additionally, we are bombarded with news of negativity, and burdened with struggles beyond our own daily lives. We don’t feel we have the capacity to take on any more outside shame, guilt and stress. Fortunately, our food choices is an area where a little bit of awareness can go a long way. In shrinking the gap between you and the source of your food, the producer, our community, our economy and your household, can all benefit directly. By choosing to support local, you can keep your money in your community, encourage environmental stewardship and sustainable growing methods, and experience high quality products backed by true passion. Not to mention the health benefits that come with a whole food diet, and the undeniable sense of connection you get when you cook and share meals with friends, family and neighbours. 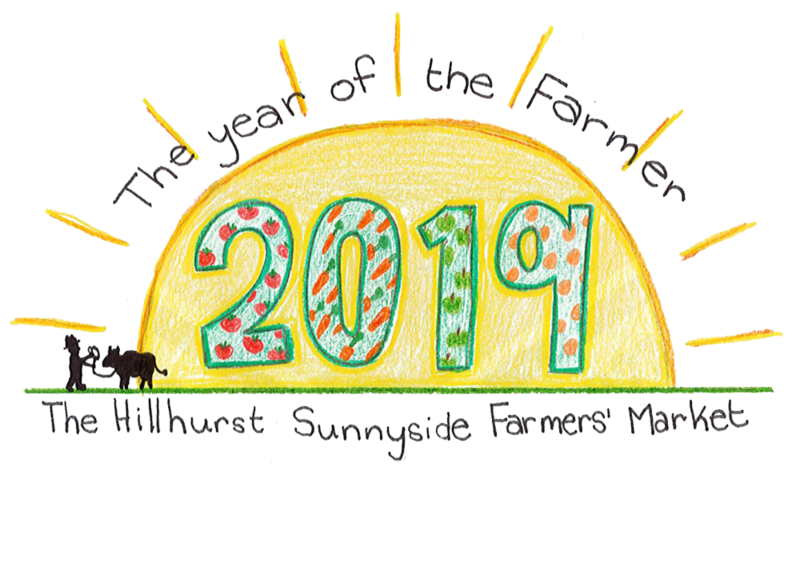 In an effort to combat the growing gap between eaters and producers, The Hillhurst Sunnyside Farmers’ Market has declared 2019 The Year of the Farmer. As an Alberta Approved, community-driven Farmers’ Market, we look to provide an important alternative to our conventional food system. We believe in the family farm, small business, and the power of voting with your dollar. We prioritize good food, authentic producers and a slower pace. We look to lighten the load for everyone, and share the burden of the agriculture industry with our farmers and customers. We are SO honoured and excited to have been nominated for Best Farmers' Market in Calgary for the 2019 "Best of Calgary" awards. We are just a small community market, but we have HUGE spirit- all thanks to the vendors, customers and good food friends that make up our market family. As a true, Alberta Approved Farmers' Market, we are proud to prioritize Alberta products and keep things as local as possible. For this competition, we are going up against some of the biggest players in Calgary; help us make our dreams come true and show YYC that a little market with a big heart can take this one home! We're building a 'Good Food Community': Our Farmers' Market really is, as one vendor says, "the tip of the iceberg". This market is just one piece of the greater good food puzzle that we host here at the Hillhurst Sunnyside Community Association. All our fundraising efforts, and any extra profit we are able to make, allows us to support our weekly food access program for those in our community struggling to access good food. We also host many special events throughout the season to help you connect with your food, your producers, and have fun doing it! We are Alberta Approved: This provincial standard requires that we operate as a non-profit, and maintain at least 80% Alberta made, baked, and grown products. We blow this percentage out of the water each year! In 2017 we hit an 87% average year-round. When you come to our market, you know that everything you buy has been handpicked by our team with this standard in mind- however we do still encourage you to ask questions and get to know your grower! We do it all for the love of good food: We provide our customers with a genuine market experience. We do our best to provide lots of variety and high-quality goods in a relaxed setting. Our producers are some of the best in Alberta and they're all genuine about their love for their industry. These vendors truly love what they do, and are so proud to be a part of your weekly shop. You can feel the local love from the second you walk in the doors, and with each bite when you chow down on your fresh, local purchases. Thank you SO MUCH to anyone who nominated us for this honour! Please take a few minutes and let your voice be heard for the Best of Calgary awards. Share with your friends, family, and neighbours and celebrate small business in our beautiful city!